How to check PABSON result? 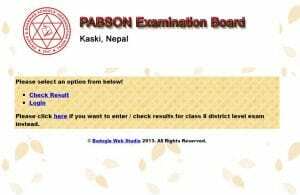 How to check up PABSON (Private and Boarding school organization Nepal) exam result? Open up a new web browser. You can use any web browser you feel easy to use like Chrome, Mozilla, torch, internet explorer etc. Type a web address pabsonexam.com and click Enter button. You can simply click on the link given here. Click the link Check Result. First, enter your symbol number in the first section. Then, you will know your result whether you are passed or failed. 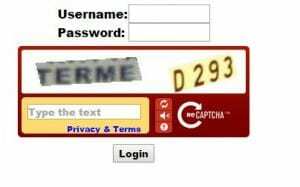 Please enter your correct symbol number. To view your mark sheet, you need to enter your date of birth. For this, enter your symbol number first and then enter your full date of birth in the Mark sheet section as seen in the figure above. You will be shown your mark sheet. Please enter your correct date of birth and symbol number for the accurate result. How to log in your PABSON account? If you have an account, then you can directly login to your account. For this, please follow the given steps carefully. They are very easy steps. Open up the homepage of PABSON as described above. For this, follow the steps from 1 to 3. Then, click on the login. Enter the code seen in the image carefully. If you can’t identify the words, you can simply refresh it by clicking on the refresh button. For those who have a problem in vision can just click on the volume icon to hear the words. After that, click on login. If your username and password are correct, your account will get logged in. How to check up District level exam result? Follow the steps as is it form 1 to 3 from the first part. Click on the link here as shown in the figure first for the district level exam result of class 8. Then, you will have two options as shown in the figure. If you are a school representative, then click on the first link. Enter your correct username first. 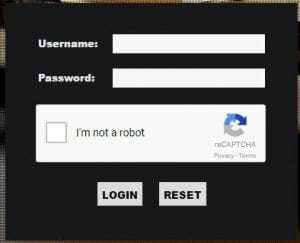 Click on the box I’m not a robot. If you are not sure about your school code, then click on the second link. 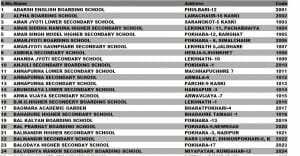 Then, you will get the list of school name that are associated with PABSON with their respective code number as shown in the figure below. Use this code to know your result. PABSON stands for Private and Boarding school organisation Nepal. It was established in 2047. Shambhamphe is the current chairman of PABSON elected by the 13th National General Convention. how to check up PABSON exam result? PABSON exam result send up result step by step process to check PABSON result?